Stanley Black & Decker tested three identical parts printed on the Metal X. 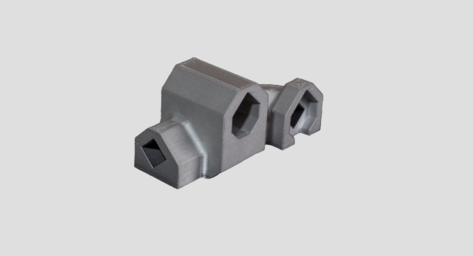 These parts proved durable through tens of thousands of cycles and strong enough to handle significant compressive load while also being 53% lighter. The original actuator housing consisted of four parts—a cast and machined main housing, laser-cut cover plate, and two bolts to fasten the housing assembly together. Stanley Infrastructure engineers worked with Markforged to redesign the part for printing on a Metal X. Instead of a four part assembly, the redesigned part prints in one piece without support material, saving manufacturing and engineering time.